Brindle dog breeds have brown fur with dark flecks. This pattern is caused by the interaction of the Agouti gene with various other genes. Some dog breeds with brindle coats include Mastiffs, Dachshunds, and Bull Terriers. Does the brindle color affect temperament or health? And how does the brindle color happen? Read on to learn everything you need to know about brindle dog breeds. What Is a Brindle Dog Coat? The brindle is a coat pattern, sometimes called “tiger striping,” appears as irregular stripes or spots on a base color of the dog. Generally, the base color is not much lighter than the stripes. So, it can be a subtle but interesting pattern. For example, brown stripes could appear on a lighter brown coat. Some dogs are so-called light brindle in color—mostly red with darker stripes. Whereas others are heavy brindle—at a quick glance, the dog appears black or dark brown. You may also the term reverse brindle. This is the same as black brindle. What is a Reverse Brindle Coat? 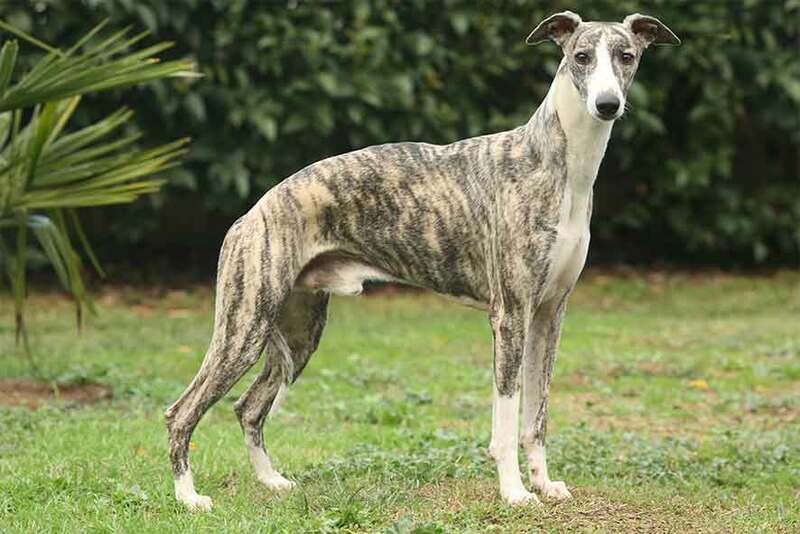 The terms reverse brindle and black brindle are used to describe a brindle dog coat with a high concentration of darker stripes causing the brindle to look reversed. With reverse brindle dogs, light stripes appear to sit on a dark background. You sometimes see reverse brindle in Boxer dogs that look black. 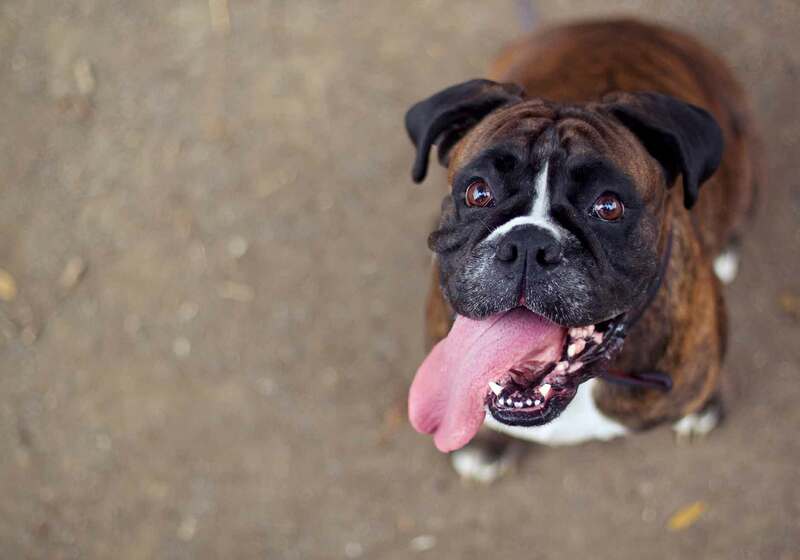 Since Boxers cannot be black, most dark-colored boxers actually have dark brindle fur. In some dog breeds, the brindle pattern is encouraged in purebred show dogs. In others, brindle coloration is less desirable. Brindle patterning can also appear on different animals, such as horses, cats, rodents, and even lizards. This doesn’t mean those animals they have similar genetics, however. They are just visually similar. Dog coat color is based on a number of different genes that control two pigments: pheomelanin (red-yellow) and eumelanin (black-brown). In brindle dogs, eumelanin is responsible for darker stripes whereas phaeomelanin controls the base color. One of the most important genes involved in coloration is called the Agouti (A locus) gene. It switches on and off the red and black pigments in dogs. A particular expression pattern of the A locus gene can also give rise to tricolor dogs. Moreover, the way the A locus gene interacts with other genes can result in various colors from fawn or sable to black and tan. For example, the K locus gene is also involved in coat color and pattern. This gene has three so-called alleles—variations— that result in either a black (Kb), brindle (Kbr), or fawn (Ky) coat. In other words, the K locus gene affects how the Agouti gene is expressed—the Kbr allele allows the Agouti gene to show up as brindle coloring. And different A locus genes determine how the brindle shows up in dogs. Genes can act differently in different dog breeds. For example, brindle (Kbr) is the dominant allele in Boxers. That’s why most boxers are brindled in some way or another. In many dogs, the brindle gene is recessive to dominant black. There is still a lot of research to do. We don’t yet know how to genetically test for the brindle coloring. And it’s still unclear what controls the various aspects of brindle, such as stripe width. We do know some things, though. Researchers have determined which gene determines color intensity. Moreover, all brindle dogs can still have white markings on their coat. Sometimes called a trindle or tricolored coats. To make matters even more complicated, not all dogs can have a striped brindle coat. And not brindle patterns appear in the same way in different dog breeds. Brindle coloring itself is not an issue in terms of your dog’s health. But, it can be mixed with other color coat genes that do lead to health problems. For example, the merle gene is known to cause ear and eye problems in dogs. Merle coloring mixed with brindle coloring often results in an interesting combination of dark stripes mixed with shorter stripes and spots. This is quite a subtle effect but has health implications for any dog breed with the merle and brindle genes. Dogs suspected of having the merle gene should be tested for it, to prevent the merle gene from being passed to another generation. Double merle dogs—two merle alleles, one from each parent—often suffer from more severe problems. Therefore, it’s wise to pay attention to any genetic health issues brindle breeds might be susceptible to. Here is a list of brindle dog breeds. We’ll start with larger brindle breeds. This beautiful, big-boned dog is the largest of Japan’s native breeds. It comes in many colors, including brindle. Boxers actually come in just one main coat color, fawn, that comes in various shades. But they can be brindle with a fawn color base. The brindle pattern is extremely common on boxers. In fact, dark-colored Boxers most likely have dark—even black—stripes on a fawn coat. Reverse brindle makes them look black. The main coat colors of the Mastiff are fawn, apricot, and brindle. 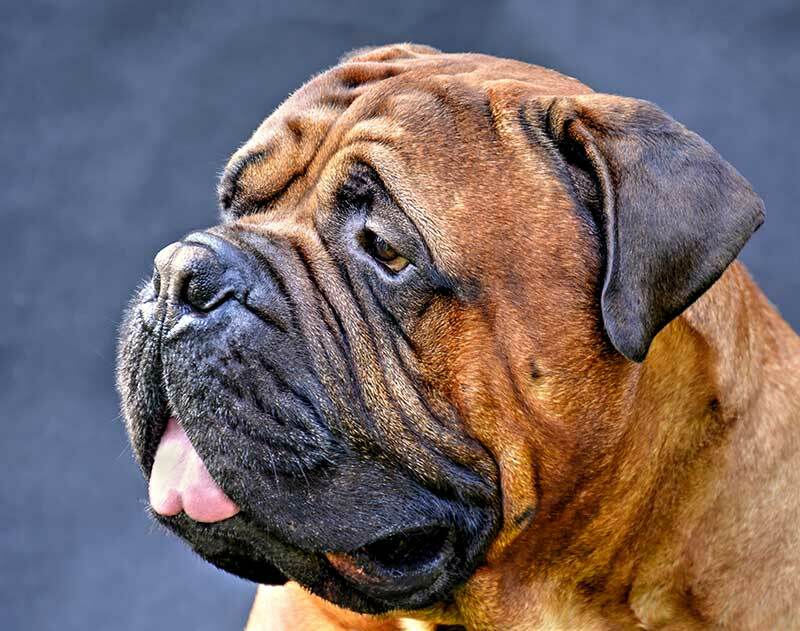 Brindling on the Mastiff usually consists of a fawn or apricot color in the background and dark stripes on top. The muzzle, ears, and nose of the Mastiff are typically dark, as well. Brindle is acceptable in Great Danes. The American Kennel Club (AKC) breed standard says that the base color for this breed should always be yellow gold with black cross stripes, in a chevron pattern. 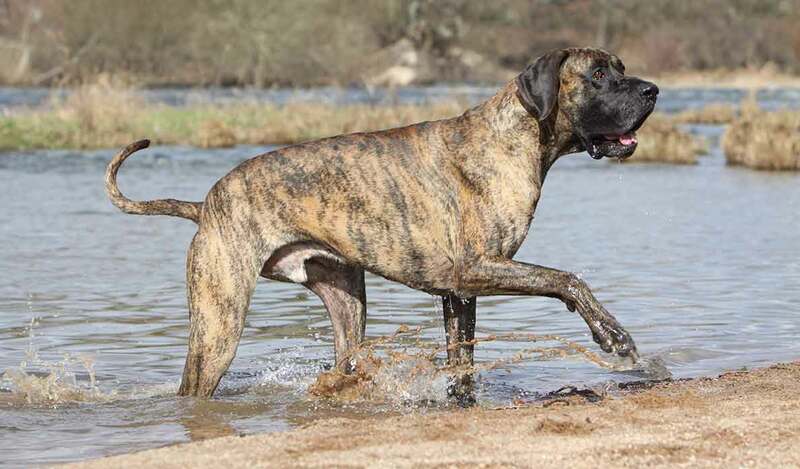 In Great Danes, an intense base color and distinct, an even brindle pattern is preferred. Variances like too little or too much brindle, large white areas, and “dirty” brindles are faults. Small brindle colored dog breeds are super cute! The AKC breed standard for the Cardigan Welsh Corgi lists all shades of red, sable, and brindle as allowable. They can also have brindle points. 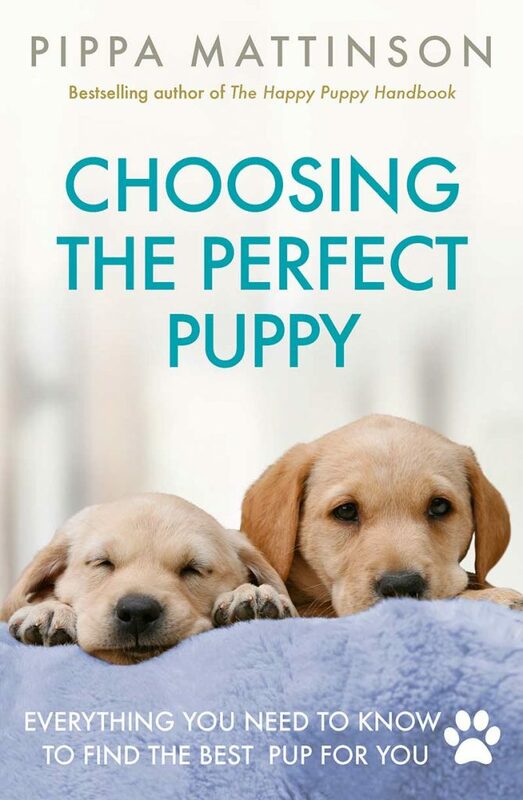 In Corgis, there is no color preference for purebreds and all listed colors and shades are desirable. Dachshunds come in three different types of coat: long-haired, wire-haired, and smooth. 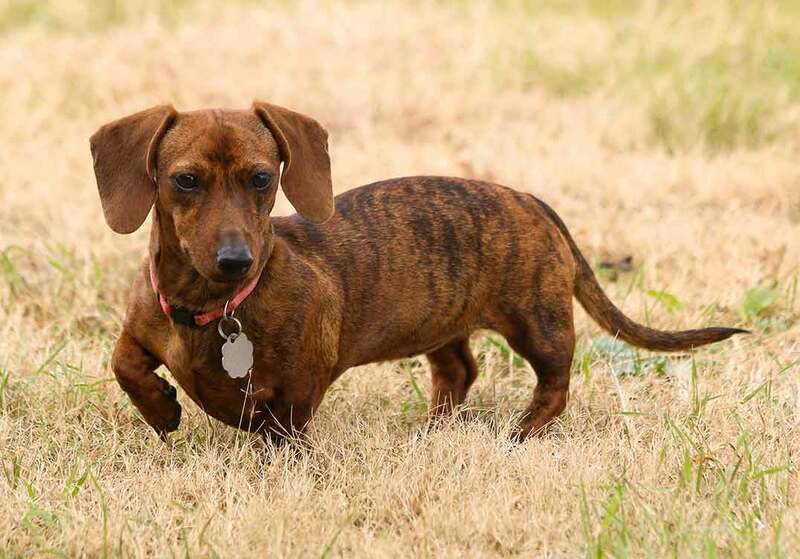 Brindle is considered a standard pattern in smooth dachshunds. Chihuahuas come in a wide variety of colors and patterns! While brindle is not a particularly common coloration for this breed, brindle Chihuahuas do exist. The official breed standard states blue brindled fawn, chocolate brindled fawn, and fawn brindled black as possible coat colors. Brindle is a common pattern on the small but heavy-looking Bulldogs. Often you’ll see fawn or red as a base color. Red brindle is often considered desirable in this breed. Some terrier breeds can show the brindle gene, too. These include the following. The American Staffordshire Terrier can come in many different colors, including solid, parti, and patched colors. 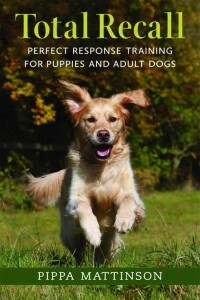 They should not be more than 80 percent white, according to the AKC standard. Bull Terriers come in white and colored varieties. White Bull Terriers may have some colored markings. According to the AKC, brindle is actually a preferred color for colored Bull terriers. One of the cutest things about the Boston Terrier is their so-called tuxedo—a colored area accompanied by a white area. This tuxedo jacket can come in seal or black brindle. It’s clearly visible on the colored area of a Boston Terrier’s fur. There are some great hound breeds that show brindle! 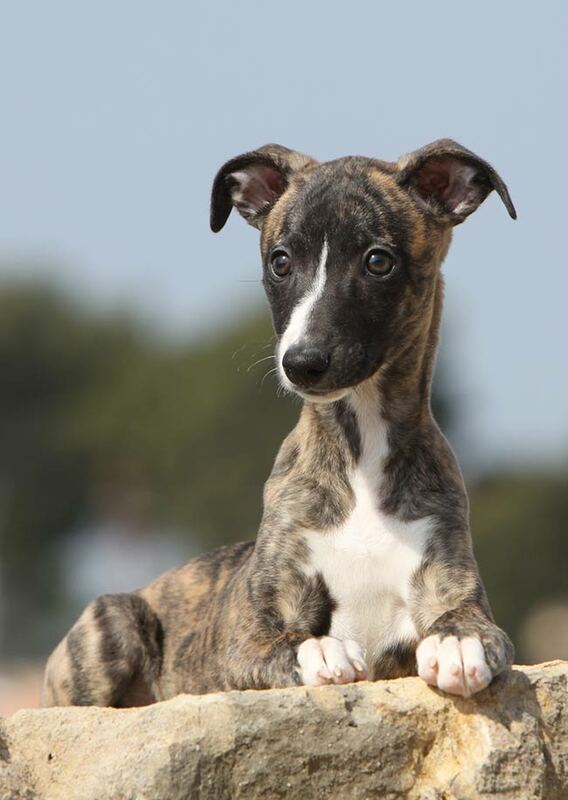 These lanky dogs come in many different colors, including several shades of brindle. These include black brindle, blue brindle, and red brindle. Any of these brindle patterns can be combined with white areas in different combinations. The red brindle pattern is preferred. Especially if the colors are fine and evenly distributed. These lightning-fast sprinters are available in blue brindle, fawn brindle, and red brindle. These combinations can come with white markings as well. The streamlined Plott Hound comes in black brindle, blue brindle, chocolate brindle, gray brindle, liver brindle, orange brindle, red brindle, tan brindle, and yellow brindle! You can even get buckskin, tan, malt, and dilute black factors in Plott brindle colors. 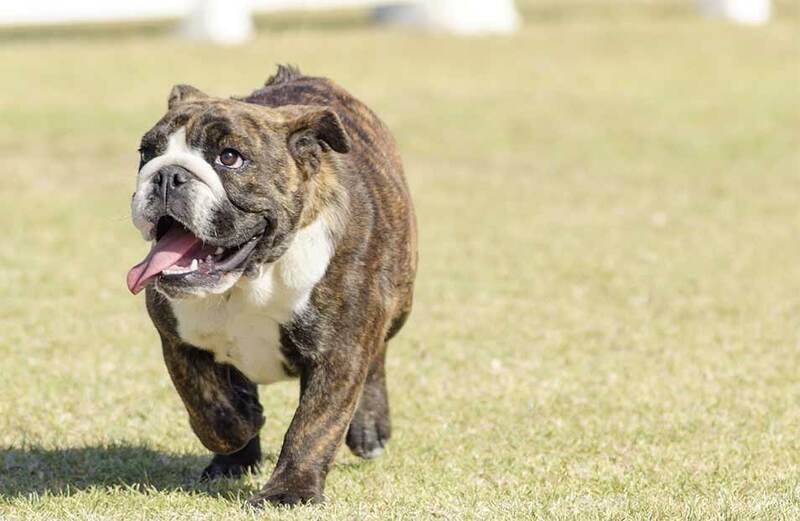 In these dogs, the AKC breed standard says that any shade of brindle is preferred over solid. Yes, this dog breed has Brindle in the name! Standard colors for the Treeing Tennessee Brindle are black and brindle. They can also have a brindle trim as a marking. This coonhound breed is in the AKC Foundation Stock Service. So it’s not yet a full registered member but under development. 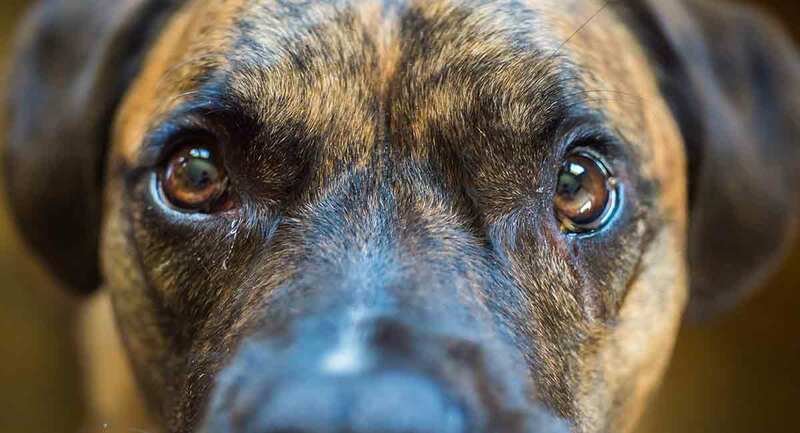 The United Kennel Club does recognize it, though, and says that any color other than brindle or black with brindle is considered a serious fault. What Dog Breeds Have Brindle Coats? Which will you choose? Let us know in the comments! Asher L et al. 2009. Inherited defects in pedigree dogs. 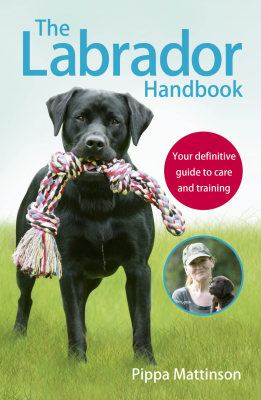 Part 1: Disorders related to breed standards. The Veterinary Journal. Kerns JA et al. 2007. Linkage and segregation analysis of black and brindle coat color in domestic dogs. Genetics. Strain GM. 2004. Deafness prevalence and pigmentation and gender associations in dog breeds at risk. 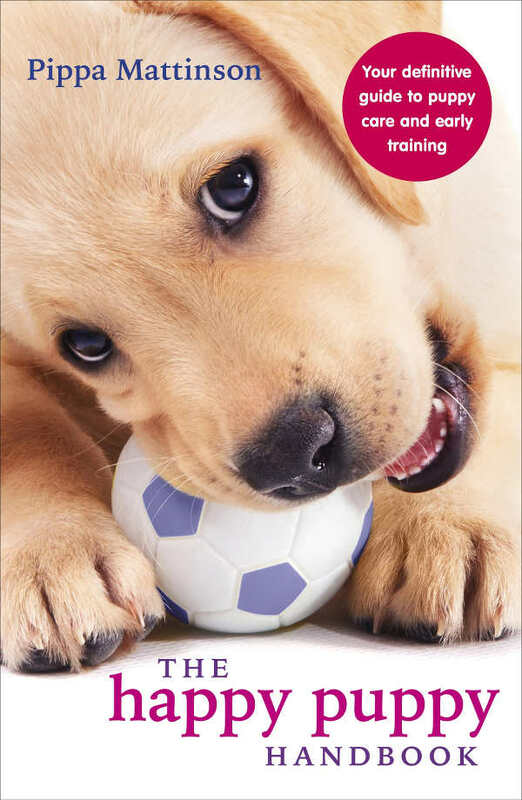 The Veterinary Journal. My grandson got a new pup (just turned a yr old). Said it(male), was a brindle bloodhound/lab mix. This furbaby is a handful, but the new love of my life! What’s odd, is, I’ve not seen any pictures that look like him in same breed? He is beautiful!